Today, the National Oceanic and Atmospheric Administration released its annual harmful algal bloom forecast for Lake Erie. Every year, agricultural runoff pollution causes harmful algal blooms. This thick, green algae covers large parts of the western Lake Erie basin. This afternoon, the Alliance for the Great Lakes held a webinar to break down the harmful algal bloom forecast and hear from people directly impacted. We were joined by partners at Junction Coalition, Freshwater Future, Ohio Environmental Council, and Michigan League of Conservation Voters. Together, we provided an overview of what’s being done — or not being done — to clean up Lake Erie and recommended clear next steps for elected leaders. Algal blooms can be hugely impactful. Last year’s bloom was the third largest on record, with thick, green slime covering more than 700 square miles in the western basin. On today’s webinar, Megan Powell, Environmental Specialist at Junction Coalition in Toledo, shared her perspective. Powell described the stunning reality that every summer, people in her community worry about whether they will be able to drink their water. “The traumatic experience of not having access to clean water is long-lasting,” Powell said, recalling the time in 2014, when half a million people in Toledo lost access to tap water because a small but toxic algal bloom contaminated their water intake. Powell shared that she saw people stocking up on pallets full of bottled water at the grocery store, preparing for a summer algal bloom. This indicates a constant state of fear, she said, of losing access to clean water again. Policy Update: What are the jurisdictions doing to clean up Lake Erie? Three years ago, the Governors of Ohio and Michigan joined with the Premier of Ontario to commit to reducing the amount of runoff pollution, specifically phosphorus, flowing into western Lake Erie by 40 percent. They’ve created action plans that address all sources of pollution — including chemical fertilizer, manure, wastewater and more. Unfortunately, the states’ plans lack accountability mechanisms, have few clear deadlines, and rely heavily on voluntary programs. Michigan has listed its portion of Lake Erie as an impaired waterway, which opens up new tools and funding streams to address the problem, but the state’s action plan lacks teeth and fails to address failing septic systems. Ohio also designated Western Lake Erie as impaired, and yesterday, Gov. Kasich issued an executive order that sets up a process for stronger pollution rules, and signed the Clean Lake Erie 2020 bill into law — the state still has a lot of work to do policy-wise, but these recent developments suggest strong forward momentum. The Ontario plan includes good ideas, but lacks clear timelines and has major policy gaps. The good news is that there are clear policy steps that governors and the premier can take to reduce harmful algal blooms right now. 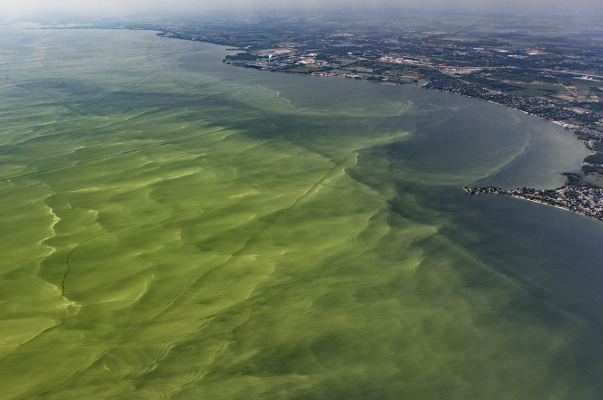 At the height of last year’s massive algal bloom — which spanned more than 700 square miles of Western Lake Erie — we released an original report, Rescuing Lake Erie: An Assessment of Progress. In the report, we analyzed the root of the algal bloom problem and examined potential policy solutions. We also included three topline policy recommendations that should be implemented immediately. Join us in urging the governors of Ohio and Michigan, and the premier of Ontario to take immediate action on the most basic steps to jump start progress toward a healthy Lake Erie. Lake Erie – and every Great Lake – ought to be clean and safe for all people, not so polluted that it is a threat to our health and our regional economy.